I've been looking forward to reviewing this stick, gentlepersons. Of master blender Francisco "Chico" Rivas, I am a fan. Brown leather shoe colored with a good bit of espresso bean marbling over an under-hue of goldenrod. Toothy and wooden look and hand-feel. Nice oils in a nigh matte finish sheen. Veins are present and a couple/few crimp, one runs horizontally in the 2/3's opening. Overall, a bit of a lumpy visual. Hand-feel is far smoother and has a nice even grit under oily transfer to mitt. Seams are a bit off-kilter, ranging from nigh invisible to nigh loosey-goosey. They're particularly curious at the cap... that cap is short yet well-affixed, resting on nice 'nuff shoulders. Very honey bouquet under the schnozzing. Sweet tobacco. Sunlit hay. Pale spices. At the foot, is a sweet dirt addition with some white pepper. Cold draw is a medium+ tension and gives much of the schnoz. Quite uniformed, there. Perhaps some caramel is added. Sweet creamy cold finish and mouth-feel. Verily, there's a cedar influence in another cold pull. Peppery leathery earthy woods, are the aromas created via toasting the foot. Lights easily and evenly. First pull is a strong white pepper and light red spiced thing mixed with creamy sweet cedar. Draw is a tick less tension'd than it was when cold. Second hottie is retro-haled to sweet n' spicy woods riding on a toasting creamy leather now. Creams seems to be touching on each note. Caramel is coming in. Finish is a sweet grain with a distinct spiced apple note. Third pull is the fruitiness finding cedar. A toasting of both wood and grain, but very softly so. Cream is coming way up at end of draw and into/through a -long legg'd finish. Coffee and cream is at the end and then a somewhat mineral-laced finish with a tick of salty attachment. Even burn and from it a now 1/4" of heather grey burnt offerings. A sheath may be forming, but too, a tick of flake -- it's quite too early to see. Tooth is there in crystals. Packing softened just the slightest of hairs on the light. Draw tension is a medium and evenly received. Smoke builds and builds in white clouds of sweet leather cream with a slight white pepper vibe. Very creamy texture of smoke; excellent moisture level in my smoke-hole. Very neat start to this El Retiro, gentlepersons. Classical medium profile thus far in. A pale nut paste seems infiltrating the cream. Mineral meanderings are meandering away. Apple comes up strong and juicy. If ya told me apples grow on cedar trees, I'd believe ya 'bout now. Autumn baking spices flex in the apple note. Cedar is quite nuanced in a cream and a lending of those spices. White pepper sautes in creamery butter at the mid-middlings. Sweet hay in sunny earth is a fine under-belly. An aromatic tobacco flits into the upper middling and it's felt, too, on the creamy mouth-feel in a bissel tip o' the tongue tingling. Cider meow. Profile is still a classically delivered medium with a low+ strength. There is some flowering of ash, but it doth hold to an inch of tight ladder-runging on. Line is even and of a medium thickness. Packing holds its density and in an even manner. Draw is consistent and smooth. Pacing seems a hair quick, but too, even. Room note is an autumn-laced aromatic tobacco with a sweet leathery addition. Retro-hale now is a honey-dipped affair. Some caramel apple drops to the palate. Mulling spices. Grains of oat and barley. Mid-point transition is all about that grain with an aromatic tobacco lead. Under-belly of earth and hay sweetly rises and flexes. Strength ticks up to a medium. The more white pepper seems ground a bit coarser. Cream toasts. Apricot, dried and candied. Butter and honey meet next to the grains and there's an explosion there of complexities. Notes, now with a medium+ flavor all grow in their nuanced richness. Body hits a medium+ on a still smooth texture. The up-tick in profile is so cushioned as to almost be missed, had I not an impeccable keen eye, gentlepersons. Modest, me, as well. Finish lengthens and is more spiced than sweet, but still sweet. As the second act closes, profile dips to an again medium, across-the-board. Supremely balanced. Fantastic complexities and nuances. An artisan bread note, white, comes into the core. All orbits around it. Honey buzzes and has a slight graham attachment now. A re-touch is mandated, on account of line and a further petering of draw. It's well-accepted and I chug along after a quick purging. Band removes sans ado. Smoke out-put off both ends returns to its previous splendor. Bready spiced sweetness. Smoke-hole is well-coated in a sweet cider creaminess. Bran note comes in. Medium+ body. Medium flavor and strength. Honey hides some. White pepper has some black accompaniment now on a retro-hale. Cider sees a greater spiciness. Tongue tingle doth enhanceth; some targets the space under my tongue. Smoking pace slows off a dead-even burn. Coffee is roasting deeper and the cream settles below. Ah, two puffs later, the cream rises to an equal footing. Table sugar. A pale melon. Tingle eases as aromatic tobacco takes further hold. Leather douses in an oily fashion. Graham cracker finish -- the type that is under a New York Cheesecake. Black pepper trace leaves the white to again saute in a creamery butter note. Ash pales and gets some silvery bits. At the band, that pale nutty paste mounts and carries the aromatic tobacco note on its shoulders. Spiced cedar and cider. White pepper. Packing holds admirably well. Smoke stays cool and the texture while tickling coarse, remains smooth. We shall say smooth sans boredom. Draw does tighten a tick, but remains in its previously mentioned realm. A final retro-hale shows a neat black pepper revival, creamy and now finely ground. 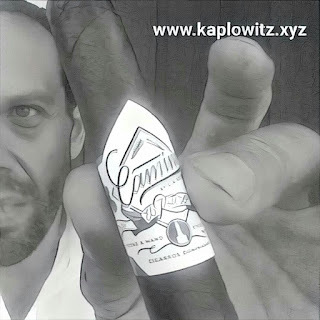 A very eventful balabusta of a stick from Caminos -- a brand yer sure to hear more of in the future. A comfortably rising strength shows me the door. New York Style Cheesecake and Cherry Manischewitz, por favor.